What do you do when the thrill is gone? We're talking about the thrill of a new paint job you just completed, and now all you’re left with is that empty feeling of cleanup and extra paint you don’t want. This tutorial will discuss various options for responsible paint recycling or disposal. We’ll cover the proper way to dispose of or recycle leftover paint, as well as how to dispose of paint cans, aerosol cans and paint solvents. To understand proper disposal methods, it's important to understand the elements which make up paint and their potential impacts on the environment. Paint is a mixture of four basic ingredients: pigments, resins, solvents, and additives. It’s the type of solvent used in the paint that determines how you dispose of it. At the end of the day, all paints basically fall under two solvent categories: mineral-spirit- based solvent, or water-based solvent. In common convention, paints are referred to as oil-based paints (basically an alkyd resin base thinned with mineral spirits) or latex-based paint (water thinned). Ironically, neither latex-based paint nor oil-based paint contains either latex or oil. TIP: A way to reduce this problem altogether is to minimize the amount of leftover paint from the outset. Do you have an extra half-gallon of that wall paint used to cover the living room? Roll on an extra coat, even though it doesn't need it. Or, use up your leftover paint to coat the inside of a utility shed or the walls of a basement storage room. The safest, most efficient way to handle leftover paint is to use it up. First, consolidate all partial cans of the same brand, sheen, color and solvent type into as few cans as possible. 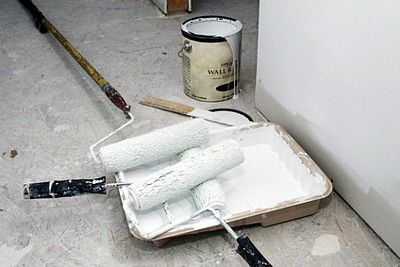 In other words, if you have a ½ gallon of one paint and a ¼ gallon of the same paint, combine them into one gallon can ¾ full, and dispose of the now-empty can. These days, charities have been so inundated with paint donations, though, that you may have trouble finding organizations that want your leftovers. If you can't give your leftover paint away, read on. Don't ever throw liquid paint away in the trash, as it is not accepted in solid waste landfills. Many communities have a Household Hazardous Waste collection program or have a waste collection center nearby that will dispose of your unwanted liquid paint. To find one, call your city hall or try this website by earth911.com. Just input the word “paint" and your zip code in the appropriate boxes. If there is not an HHW center near you, or if you want to dispose of the paint yourself, then proceed as follows. Note: this is for latex-based paint only; you cannot do this with oil-based paint! To dispose of liquid latex paint, you have to make it a solid. Pour the unused latex paint into a container of absorbent material, such as cat litter or sawdust. This works best if you pour some of the absorbent material in the bottom of the container and then slowly pour the paint in while stirring to mix the paint and the absorbent. Let it dry outside, if possible, or in a ventilated area. 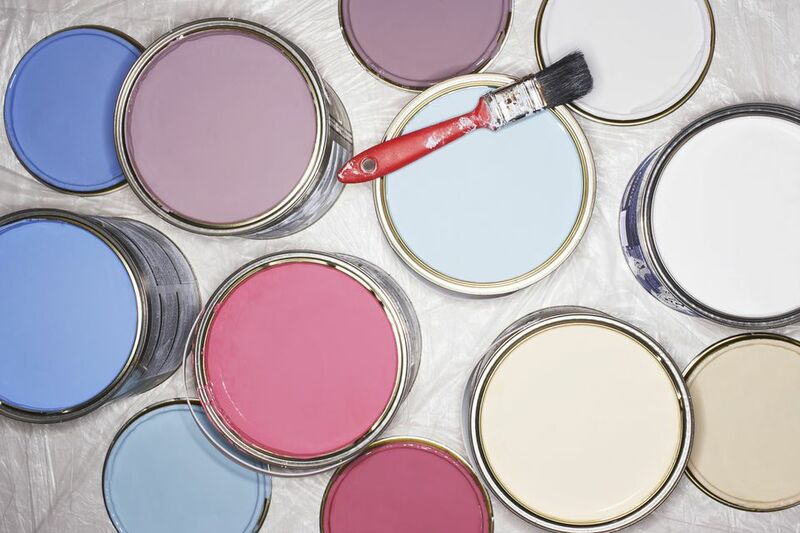 Once completely dried, you can dispose of the dried paint in your regular household trash. Mineral-spirit-solvent based paints, commonly known as oil-based or alkyd-based paints, must be disposed of professionally because of their high VOC content and resultant flammability. You cannot dry the paint and dispose of it yourself like latex paint. Oil-based paint must be specially processed for disposal. Take the oil-based paint to a disposal/recycling center in your community or near you. To find one, call your city hall or try ​earth911.com. Type in the word “paint and your zip code in the appropriate boxes for a list of sites that will accept your paint. If there is not an HHW site near you then contact the regional EPA office responsible for your state, or contact your state Department of Environmental Quality for a disposal site or disposal guidelines. Completely dry paint can that contained oil-based or latex-based paint may be disposed of in the trash or in your community’s recycling program, if you have one, and if they accept paint cans. Before disposal, wipe the can clean with paper towels until you can see the metal bottom of the can. Make sure to take the lid off the can before disposing of it. A small amount of dried paint residue is not a problem and will not affect recycling. For aerosol paint cans that still contain paint, you should follow the instructions on the product’s label. If you cannot get the paint out because the nozzle is broken or missing, then it must be disposed of at an HHW site. To find one, call your city hall or try the search.earth911 website. An aerosol can must be empty in order to place it in the trash or recycle it. Never puncture, crush or incinerate the aerosol paint can. If possible, solvents such as paint thinner/ mineral spirits and turpentine actually should be reused, not thrown away. Place the used solvent in a tightly sealed closed glass container until the particulates settle to the bottom of the jar. This can take several days. Carefully pour the clean solvent off the top and into a clean container with a tightly sealing top. Add absorbent material such as cat litter or sawdust into the container of residual dirty solvent. Let the residual dirty solvent dry into the absorbent and then dispose of in the household trash. How Much Does It Cost to Paint Furniture?